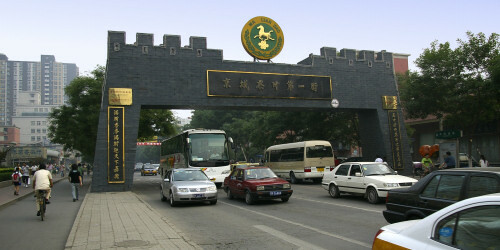 The real name of the street is Maliandao, and you'll find it in the southwestern parts of Beijing. It stretches almost a mile in north-south direction, and it holds hundreds of tea shops, swarming on each side of the street and in the large tea markets. Alongside cups and tins with green tea, jasmine tee, flower tea and oolong tea, you'll find tea cups, teapots, tea tables and anything else that can be associated with Chinese tea. Mass-produced cups and pots can be purchased cheaply, but there are also shops here that sell really expensive china produced by well-known Chinese potters. Of all the indoor markets on Tea Street, two are more popular with tourists than the rest. The first one is the newly built market in the south. Some of the shops here claim to be open 24 hours a day. Unfortunately, we don't know anyone who has felt the need to buy tea in the middle of the night, so we can't give you any guarantees, but if you've tried it, please let us know about your visit! The other market is called Maliandao Tea City - or Tea Joy Market as the sign by the street says. It is a four-storey building where three of the floors are reserved for tea. On the fourth you will, quite unexpectedly, find DV cameras, SLR cameras and other photo-related goods. If the weather is good, we suggest you to skip these indoor markets, at least to begin with, and give the shops in the bystreets, for instance those southeast of Tea City, a chance. These will give you a more authentic impression of Beijing than the polished marble floors of the markets - and it's very likely that the prices are lower. In the large tea markets, you might have the good fortune to find some English-speaking salespeople. The chance is smaller in the shops in the bystreets, but that's usually not a problem since the salespeople are so helpful. The prices are negotiable, and sometimes you need to bargain a lot.